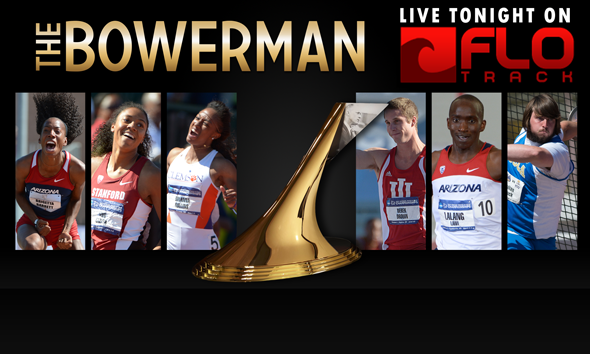 ORLANDO, Fla. – By the end of this evening, collegiate track & field’s most outstanding male and female student athletes of the 2012-13 season will be awarded the prestigious The Bowerman Trophy. Watch live on Flotrack.org beginning at 6:30 p.m. ET with the Red Carpet Show as emcee and then transitioning to the full show at 7 p.m as ESPN’s John Anderson introduces viewers and attendees to each of the three women’s finalists and three men’s finalists before the iconic trophy is awarded to one female winner and one male winner. To view the live stream, users must sign in to Flotrack or create an account. By now you know the finalists: Arizona high jumper Brigetta Barrett, Stanford hurdler Kori Carter and Clemson hurdler Brianna Rollins on the women’s side and Indiana high jumper Derek Drouin, Arizona distance runner Lawi Lalang and UCLA discus thrower Julian Wruck for the men. Now all that remains to be seen is which of the three very deserving female and male finalists will leave the JW Marriott Orlando Grande Lakes in Orlando, Fla. –the site of the ongoing U.S. Track & Field and Cross Country Coaches Association (USTFCCCA) Convention — as the most outstanding student-athletes of the 2012-13 season. Find out live on Flotrack and follow along with the show live on Twitter by tweeting at @thebowerman and using the hashtag #TheBowerman. One last look at all the finalists exceptional credentials can be found below.